The kitchen is one of the most important rooms in the home, as it’s long been known as a gathering spot, a place of celebration, and a place to get together with family and friends. However, the kitchen can also be one of the most dangerous rooms in the home. Kitchen safety for seniors is of the utmost importance if you are a caregiver. Unlike a toddler, who is just learning to crawl and explore, many seniors are well-established cooks that have made countless meals for their families over the years. While you never want to take away a hobby or something someone loves, cognitive decline is an unfortunate reality, and kitchen modifications for the elderly and an elderly-friendly kitchen makes sure that everyone is safe and happy. Beyond modifications, there are also food and preparation tips that can also promote kitchen safety for seniors. When it comes to safety hazards in the home for the elderly, the stove is one of the most dangerous. It is estimated by FEMA that the elderly have a 2.5 time greater risk of dying in a kitchen fire when compared to the general population. Because of this, stove safety, especially gas stove safety for the elderly, is of the utmost importance. Before you install a stove alarm or modify the appliances, look around the kitchen first. Many times the dangers lie not in the stove itself, but factors that could potentially cause a fire. When it comes to safe cooking appliances for the elderly, and stovetop modifications, one of the best things to promote kitchen safety for seniors is to install a shut-off switch (or even several). This includes a shut-off switch on the stove and finding other small appliances that are already equipped with one (such as a tea kettle). The safest cooktop for the elderly is one that has a motion sensor pre-installed. This way, if no one has been near the stove within a specified amount of time, the appliance shuts off. Make sure the microwave has minimal buttons and easy to use. A small microwave with a dial/timer is a great idea. Find a refrigerator that has a large-print digital temperature display so the temperature is easily set. If the patient is in a wheelchair, a refrigerator that is side-by-side makes it much easier for them to open the freezer. Note: for food safety, the refrigerator should be set at 40 degrees Fahrenheit. Choose irons (many people have a tendency to iron in the kitchen), coffee pots, and other small appliances with the shut-off switch. If they are not included, consider installing a shut-off outlet. This may seem like a lot of work, but it is so vitally important to keep your loved one safe. 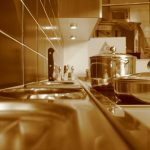 You can’t keep an eye on them all of the time, even if it is your intent, so ensuring that their kitchen is a completely safe area is an important job. To hear more tips on kitchen safety for seniors, to learn about other safety needs such as bathroom aids, or to get information regarding medical devices that can help improve mobility for your loved one, contact Williams Lift Co. today to learn about wheelchair ramps, stair lifts, and other mobility products to improve your loved one’s quality of life.